…you don’t know whether your ads are effective, which affiliates are really killing it versus which have forgotten about your launch, or even whether your own emails are converting. Looking at your sales log only, and having to decipher what’s happened since the last time you looked an hour ago, is like trying to drive in the dark without headlights. Thankfully there is a better way to track your sales, so you can see your data, get insights about what’s working and what’s not, and immediately act to increase your bottom line. Want your own copy of this dashboard? E-junkie is a digital shopping cart, used for selling digital products and downloads. The system handles the shopping cart mechanics, but does not do any data analytics or visualizations. You can view a transaction log (i.e. a list of all your sales) but if you want to understand and visualize your sales data, then you’ll need to use another tool to do this. Google Sheets is a perfect tool for that. You can use a Google Sheet to capture sales data automatically in real-time, and use the built-in charts to create an effective dashboard. You’d be crazy not to have a tracking system set up, to see and understand what’s going on during sales events or product launches. This E-junkie + Google Sheets solution is effective and incredibly cheap ($5/month for E-junkie and Google Sheets is free). The Write Life ran a Writer’s Bundle sale this year, during the first week of April. It’s a bundled package of outstanding resources for writers, including ebooks and courses, heavily discounted for a short 4-day sales window. I created a new dashboard for The Write Life team to track sales and affiliates during the entire event. This year’s dashboard was a much improved evolution of the versions built for the Writer’s Bundle sales in 2014 (which, incidentally, was my first blog post on this website!) and 2015. The biggest improvement this year was to make the dashboard update automatically in real-time. This time last year I worked with The Write Life during their three-day sale of The Writer’s Bundle, a collection of digital products for writers. 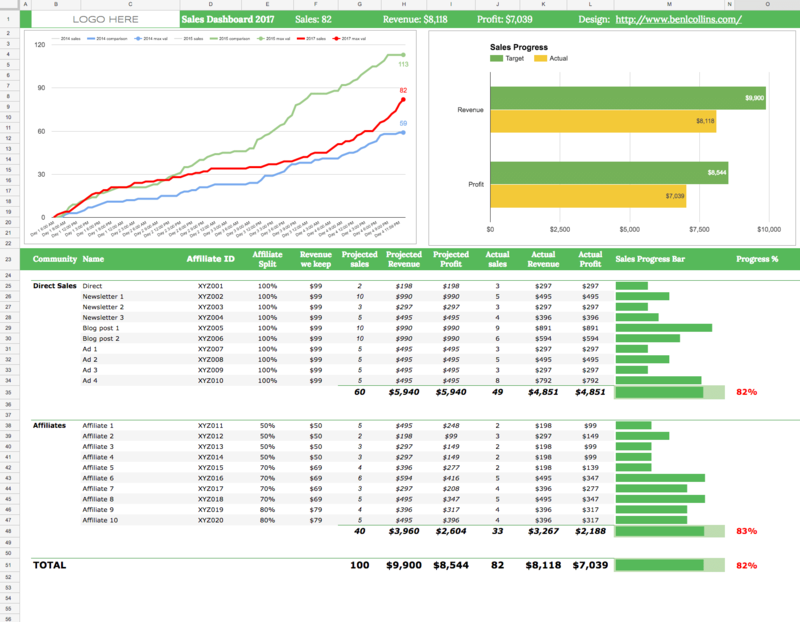 I built a dynamic dashboard using Google spreadsheets so the team could visually monitor progress throughout the sale. This year The Writer’s Bundle 2015 was bigger and better than ever, so I wanted to create an even more useful dashboard for the team. The dashboard was a key tool for the team, to monitor both overall and individual sales channel performance, as well as to be a motivating force by giving everyone a visual sense of progress. This article covers how to build a dynamic dashboard in Google Sheets, using formulas and data validation methods so that charts change dynamically based on user input. Earlier this year I worked with The Write Life team to develop some behind-the-scenes sales data analysis during their 3-day digital bundle sale. The team wanted a simple way of gauging progress and seeing how the different sales channels fared as the sale took place.